It’s gotten easier to find what you’re looking for on this eclectic blog. Step 1 – scroll down to the bottom of any page and find the “Categories” heading. Step 2- pick the category that interests you from the dropdown menu — Designer Yarn, Weave of the Week, etc. — and click on it. Step 3 – a page will open that lists all the articles in that category. The article titles are live links that will take you to the full articles when you click on them. Ploughshare, 1977, wool, 84"x84." The Yoors Family Trust. More about the Yoors tapestries (see previous post here). 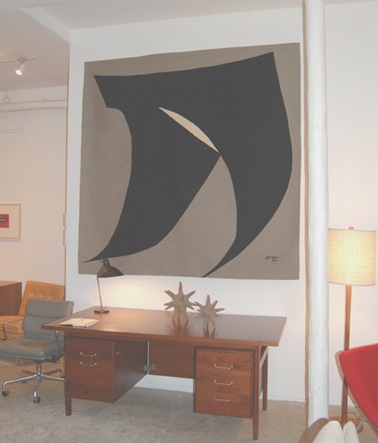 If you missed last summer’s exhibition of work by Jan Yoors, or would like a chance to see some of his fascinating output, there is currently an exhibition of tapestries, drawings, and gouaches from the estate of Jan Yoors at reGeneration Furniture, NYC. The exhibition has been extended until June 5, 2011. 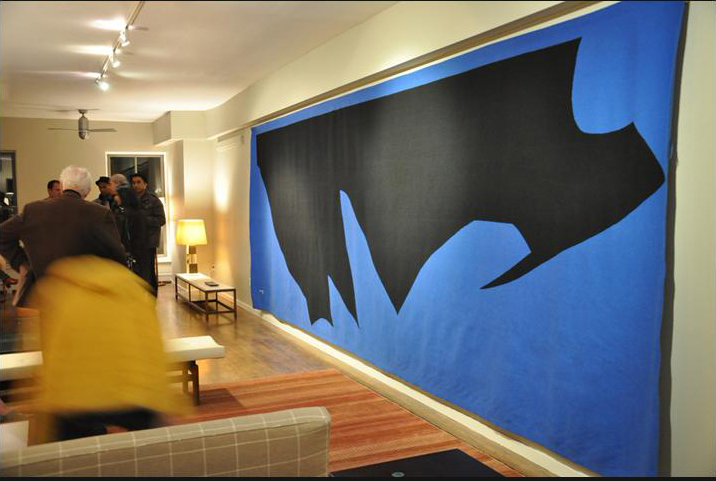 "Cobalt Mountain," 1977, wool, 259" wide x 89" high. The Yoors Family Trust. 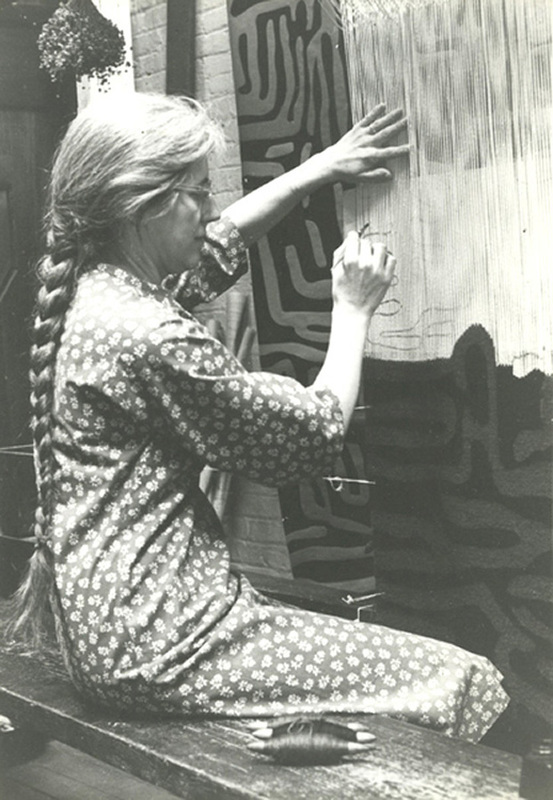 Jan, Annabert, and Marianne Yoors, together produced dozens of handwoven tapestries in their Greenwich Village Studio between 1945 and 1977, the year that Jan died. The actual number is closer to 200, seven of which are over twenty feet long. 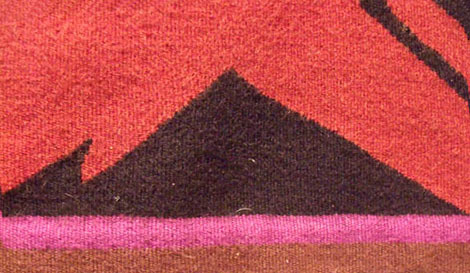 "Wolves Howling at the Moon," border detail, 1956, wool. The Yoors family’s lives were inseparable from their work. Annabert and Marianne sometimes wove for days without a break. “When you spend six, eight, ten months weaving a tapestry, you weave a foot or so and roll it up. You cannot make a mistake because it cannot be fixed.” Weaving together for fifty years, Marianne says that they wove as one person, as the tapestries’ flawless surfaces show. Postscript: Shortly after Marianne and I had our conversation, I came across this sharp snippet of dialogue, from Nicole Holofcener’s brilliant film “Please Give.” It’s only 23 seconds long, so I transcribed the clip to make it easier to understand. Note: the “tapestry” being argued about is only seen briefly at the beginning of the clip, but is clearly a cut-pile rug. Shopper 1: I feel like that would look good in our house in New Paltz, either on the wall or on the floor. Shopper 2: I’m more of a floor rug person. Owner 1: It’s actually a tapestry. Shopper 1: No it’s not. Owner 1: Yeah, it’s a tapestry. Shopper 1: It’s a rug. Owner 1: OK, it’s a rug . . . or a tapestry. Shopper 1: I’m like a hundred percent sure that’s a rug. Owner 2 (on phone): You know, I think you’re right. It’s a rug. Nicole Holofcener has perfect pitch for yuppie bickering, but I was amused that she chose a tapestry, of all things, for her characters to argue about. In 2010, there were 17 new posts, growing the total archive of this blog to 123 posts. There were 102 pictures uploaded, taking up a total of 15mb. That’s about 2 pictures per week. The busiest day of the year was July 17th with 264 views. 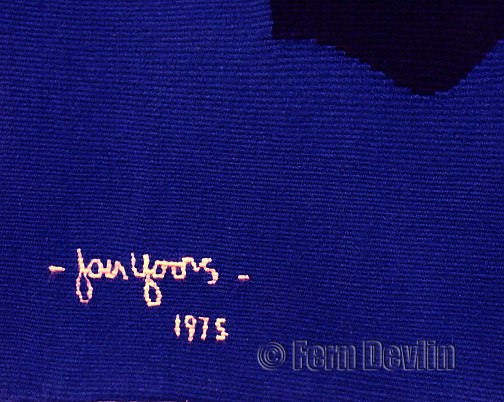 The most popular post that day was The tapestries of Jan, Annabert, and Marianne Yoors. The top referring sites in 2010 were hurdle.co.uk, en.wordpress.com, en.forums.wordpress.com, lifeloomslarge.blogspot.com, and evasweaving.wordpress.com. Some visitors came searching, mostly for liza lou, sheila hicks, liza lou trailer, yinka shonibare, and ikat. The first museum retrospective of Sheila Hicks’s remarkable career just opened at the Addison Gallery of American Art, Andover, MA, and will continue through February 27, 2011, after which it will travel to the University of Pennsylvania, Philadelphia, PA, and the Mint Museum of Craft and Design, Charlotte, NC. For information about the exhibition, contact the Addison Gallery, and for information about the exhibition catalog (shown above), contact Yale University Press. 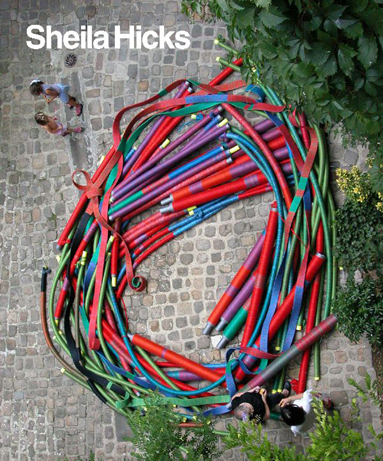 To read my previous posts about Sheila Hicks, click here , here , and here.